I am normally not one of those kinds of bloggers to post many food pictures, but last night was worthy of star treatment. 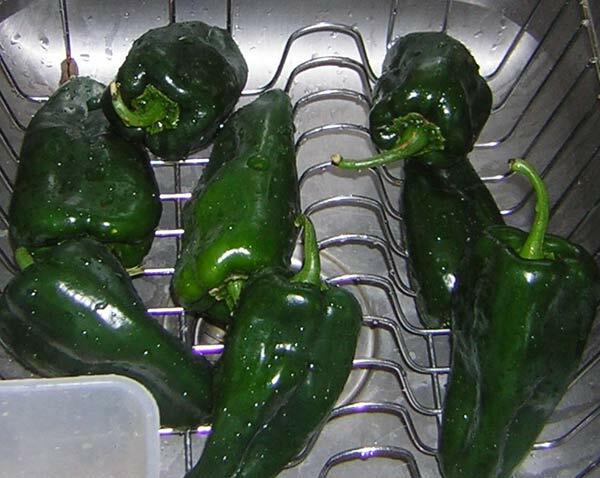 It started last week when H brought home six of the most gorgeous poblano peppers I have ever seen. 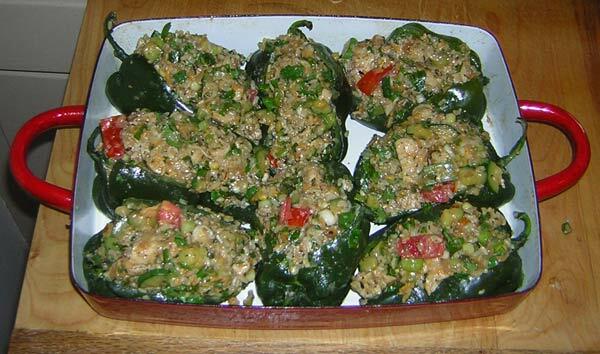 He got them at the local farm stand we buy from and I was inspired to make stuffed peppers. They were fabulous when done and I waxed rhapsodic about them to my quilt buddy Karen as we drove to Lake City last week for our retreat. Later while I was at the retreat, H bought 8 more of them from the same stand, and we kept them until last night when I invited Karen to dinner to see what I was going on and on about. First, we start with the fresh peppers. This is them right out of the fridge after being washed. Aren’t they just gorgeous? And here we are with the peppers all stuffed and ready to go in the oven. They are made with a mixture of chicken, brown rice, aromatic vegetables (a mixture of onions, sweet peppers, hot peppers, cooked corn, garlic, cumin, oregano, thyme, S&P) some grated Mexican cheese blend, chopped fresh cilantro, sauteed zucchini, sliced scallions, and diced tomato with a couple of beaten eggs added to hold it all together when it bakes. 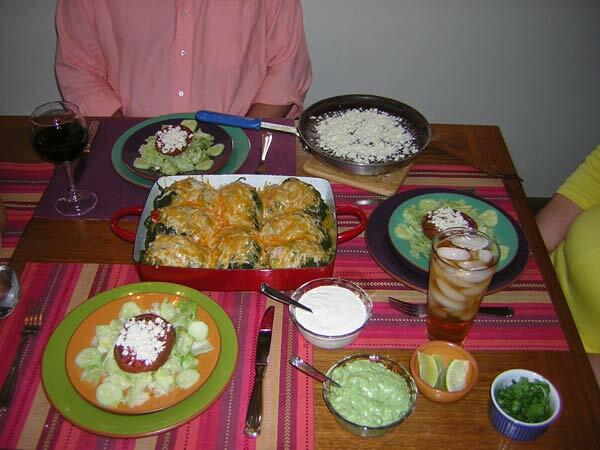 I made the recipe up myself, but I took inspiration (and directions for preping the peppers) from this site – http://poblanorecipes.blogspot.com/. And finally they come to the table, doused in salsa verde and Mexican cheese blend and all gooey and melty. I only had one pepper last night (OK, and a slice off another one), but I am still completely sated this morning. I can’t begin to describe how delicious they are. Here is the table as we sat down to eat. We had a salad, complete with fresh tomato from the garden, and refried black beans con queso fresco. There is crema (Mexican table cream) and guacamole, along with cilantro and limes. If I hadn’t stopped myself, I would have eaten until I burst. And I bought six more peppers from the stand yesterday, so I can repeat the whole thing all over again once we eat all of these! 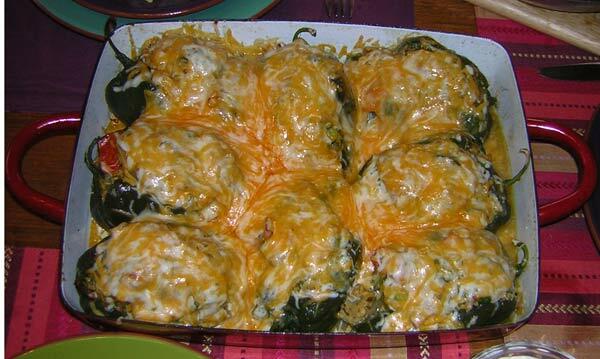 Or I may decide to make another poblano dish instead. But the peppers, like the sweet corn we are getting right now, are at their peak and simply demand to be treated well and eaten fresh.